OASIS International is pleased to announce its new partnership with Philips Lighting. 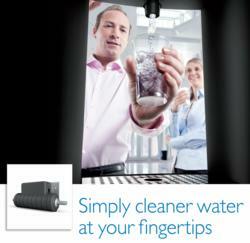 OASIS and Philips have partnered to integrate a unique disinfection solution in OASIS’ water coolers. Now, for the first time, water dispensed from coolers can be disinfected instantly and efficiently, on-demand with the Philips InstantTrust solution and will soon be available in the OASIS KALIX® water cooler, and Aqua Pointe® and VersaFiller® bottle fillers. OASIS KALIX Point-Of-Use with InstantTrust inside—on-demand hot & cold disinfected water delivery— the perfect solution for public facilities, offices, homes, anyplace where disinfected hot and cold refreshing water is needed. Many consumers are concerned about the quality of drinking water. In emerging countries these concerns may be due to the water infrastructure, but the problem is also prevalent in western countries. With an increased awareness of the dangers of unpurified water among consumers, people are increasingly relying on their own residential filters, regardless of whether there is a public infrastructure in place to decontaminate water. Philips InstantTrust disinfects water as its being dispensed, up to 4 liters/minute, its simple and quick disinfection process is ideal for water dispensing solutions such as OASIS’ bottle refill stations and water coolers. Its unique design works independently of water temperature, disinfecting both hot and cold water on-demand. The new Philips InstantTrust solution is designed to fit point-of-use water delivery solutions including taps, water pitchers, under-sink water filters and portable counter-top systems. OASIS and Philips keep working closely to make it possible to integrate the InstantTrust into its entire product line. First to market with InstantTrust water disinfection inside will be the OASIS KALIX Point-of-Use water cooler, Aqua Pointe and VersaFiller Bottle Fillers. Each of these units deliver refreshing water on-demand and are ideal solutions for public buildings, gymnasiums, sports complexes, hospitals, schools and offices. The KALIX will be the first of the OASIS water cooler line to include Philips InstantTrust. It’s the industry’s only cooler with the revolutionary Pressure Vessel Direct Chill (PVDC) system, in a stylish, modern design. The Aqua Pointe and VersaFiller bottle fillers to include Philips InstantTrust. These economical, eco-friendly bottle fillers are perfect for schools, campuses and public facilities. The Aqua Pointe is a sleek, contemporary recessed wall unit with optional side-by-side drinking fountain. The VersaFiller is an economical, easy to install upgrade to existing drinking fountains, turning most any drinking fountain into a bottle filling station; it’s also available as an all-in-one solution for areas without existing bottle fillers or drinking fountains. 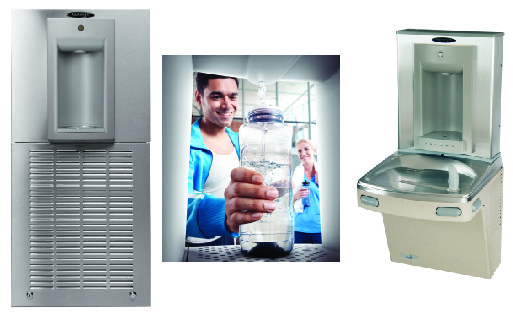 OASIS Aqua Pointe and VersaFiller Bottle Filler—on-demand bottle fillers with InstantTrust—the perfect solution for schools, colleges, gymnasiums, and public facilities— helps facilities reduce the cost and waste associated with plastic bottle waste through use of reusable, refillable water bottles. The latest OASIS coolers featuring Philips InstantTrust will be unveiled at WQA Aquatech 2012 in Las Vegas. Visit OASIS at booth #1239 and see the KALIX water cooler and Aqua Pointe Bottle Filler at work. Since 1910, OASIS has focused on delivering refreshing water to the world. Along the way we’ve become the global leader of clean drinking water solutions, innovating dynamic products such as bottle fillers, water coolers, drinking fountains, bottle/bottleless coolers and our one-of-a-kind, eco-friendly water pitcher with a reusable, refillable filter. Product information on OASIS water-friendly solutions can be found at http://www.oasiscoolers.com. Royal Philips Electronics of the Netherlands (NYSE: PHG, AEX: PHI) is a diversified health and well-being company, focused on improving people’s lives through timely innovations. As a world leader in healthcare, lifestyle and lighting, Philips integrates technologies and design into people-centric solutions, based on fundamental customer insights and the brand promise of “sense and simplicity.” Headquartered in the Netherlands, Philips employs over 120,000 employees with sales and services in more than 100 countries worldwide. With sales of EUR 22.3 billion in 2010, the company is a market leader in cardiac care, acute care and home healthcare, energy efficient lighting solutions and new lighting applications, as well as lifestyle products for personal well-being and pleasure with strong leadership positions in male shaving and grooming, portable entertainment and oral healthcare. News from Philips is located at http://www.philips.com/newscenter.